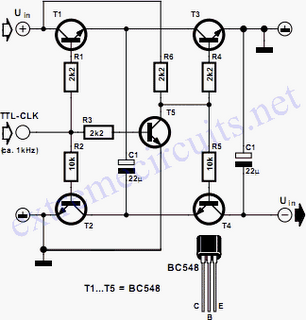 The circuit in the diagram enables a negative voltage to be derived without the use of integrated circuits. Instead, it uses five n-p-n transistors that are driven by a 1 kHz (approx) TTL clock. When the clock input is high, transistors T1 and T2 link capacitor C1 to the supply voltage, UIN, which typically is 5 V. During this process, transistor T5 conducts so that T3 and T4 are off. When the clock input is low, T5 is cut off, whereupon transistors T3 and T4 are switched on via pull-up resistor R6 and either R4 or R5. This results in the charge on C1 being shared between this capacitor and C2 Since the +ve terminal of C2 is at ground potential, its –ve terminal must become negative w.r.t. earth. The high level at the clock input must be of the same order as the positive input voltage, UIN, otherwise T1 cannot be switched on. The clock frequency should be around 1 kHz to ensure a duty cycle ratio of 1:1. Altering the ratio results in a different level of negative output voltage, but this is always smaller than that with a ratio of 1:1.